Please click the FB ‘Like’ tab to the right of the book and feel free to review, comment or rate the book while you’re there. There’s a ten page preview of the contents on the page in order to give you a sneak peek at how the book looks. Starting on July 1st (through the end of the month), I’ll be running a 30% off sale on lulu for those of you interested in buying the book online. This should offset their shipping rates and make the book more affordable to those of you who live out of state who are interested in picking up the third poetry collection. After that I’ll be doing a soft launch on Sunday, July 10th at Brennan’s Bowery Bar in Williamsville at 6 p.m. along with Mark McElligott and a live musical performance by Dave ‘The Real Deal’ Waters. If you’re a former classmate from Clarence High School, it sounds as if the classes of ’92, ’93, ’94 and beyond will be dog piling into Brennan’s on the same day for an informal reunion. At last count, there will be no less than 50 other alumni showing up, so this event is shaping up to be a real barn burner. Signed First Edition copies of Poke The Scorpion, Mockery, Slapstick & Superego, Breathing Room Volume I & II, and If They Can’t Take A Joke will be available along with Random Thoughts From A Broken Mind by Mark McElligott and 12 Priests & 3 Gnomes by David Waters. 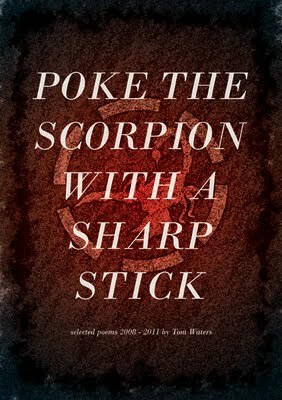 The hard launch for Poke The Scorpion will hit in August and Mark and I will start touring and promoting in Rochester, Buffalo, Alfred and beyond. While I was apprehensive about releasing two of my own books in the same year, it was a necessary evil I had to carry out in order to devote the time and energy it’s going to take to bring Icarus On The Mend in on time for a fall 2012 launch as a numbered hardcover limited edition of no more than 50 copies. I’ll be devoting at least six months to proofreading, editing and re-writing the manuscript so that it’s grammatically correct as well as entertaining from a pacing standpoint. One year later in 2013 I’ll be retiring the hardcover format and launching two smaller volumes of the same book with the intention of releasing a third volume when I get older. Somewhere in the interim I’ll release Travesty, a return to shorter form where my bombastic essays are concerned. Mark McElligott and I will both be reading this Sunday at Rust Belt Books on Allen St. in the heart of downtown Buffalo at 5 p.m. We may be a little late, so please be patient with us as we’re both driving from the suburbs. We’re paying to rent the space, so attendance and book sales for this event will be crucial. The turnout will determine whether I go back to Rust Belt books or not, so if you live downtown, make Sunday count for us please. This is the first reading I’ve done at Rust Belt in almost a decade. Mark is polished and primed and almost pitch perfect where his timing and delivery are concerned. Stockman’s, Caz Coffee and Finnan’s were good practice for breaking his teeth on audience response and now he’s ready for prime time. Look out, Buffalo, because we’re ready to make a sizeable entertainment dent in the collective populace for the rest of this year and we won’t stop until we win you over. Doubt It Publishing Author Mark McElligott will be reading selections from his breakout debut book Random Thoughts From A Broken Mind this Saturday at Caz Coffee Café at 7 p.m. in South Buffalo. Our turnout was less than ideal at Finnan’s Pub last Sunday, so it would be really nice to see some of you who might be remotely interested in supporting local arts actually show up. While we both realize that the weather is nice out, we’re in the final stretch of a three month junket and we’re busting our asses to get his book out to a new audience. If you live in (or near) South Buffalo and you’re free on Saturday, please show some support and stop out to see us at Caz Coffee Café. Most marketing and PR experts would suggest that I shouldn’t complain about a lack of turnout because it makes me look whiny or it makes us look bad. I simply don’t care. Mark and I have both invested a great deal of time and money into publishing two books and promoting them and it seems as if (now that the weather has improved) most of you have no interest in discovering just how funny his book is. Please prove me wrong. Clear up your schedule, skip a forgettable trip to the beach or a laughable summer venue and come out to see something real. If you’re the sort of person who needs a newspaper to tell you what you should be interested in or what you should spend your disposable income on, take a chance for once and discover the actual art scene in Buffalo versus the Reader’s Digest abridged version. Copies of Random Thoughts From A Broken Mind will be available for $15. On the whole I’ve been deeply disappointed with audience turnout for this junket. I have no control over it and there’s no way to analyze it, but many of you have let us down. It’s easier to do nothing than it is to do something, so take comfort in your complacency. To those of you who continue to show up for the book launches, readings and signings and those of you kind enough to tell your friends, spend money at our scheduled venues and spend your hard earned money to support our work, we really appreciate it. If it weren’t for you, we wouldn’t be able to continue creating and publishing new books. If there were more people like you in Buffalo, there’s a strong possibility that we’d actually be able to make a living wage doing this and we’d be able to produce a larger body of work, but odds are that that will never happen since most people in Buffalo (again) need to be told what art is worth buying by their local media like lost and sluggish sheep. I appreciate the cross section of you smart enough to make your own decisions and the fact that you march to the beat of your own drummer. Thank you from the bottom of my heart for making your own informed decisions based on internal judgment instead of a deep-seated need for peer approval or a desire to have someone else tell you what is and isn’t entertaining. If you receive this message via email, I understand that it’s infinitely easier to delete this message than it is to take the time to read it and react or respond to it, so for those of you who are reading this right now, thank you. To those of you who reply or react by showing up to a reading, thank you even more. I’ll get off my soap box now. At the time of this writing it is now June 9th, so the Doubt It Publishing call for submissions is now wide open until November 1st. Again, if you’re a local (Buffalo) writer and you have a completed manuscript or a draft in the realm of fiction, non-fiction, poetry or short stories, please send your manuscript in at: bigwordsmailbag@yahoo.com. One of you will be chosen for publication in 2011 and I’ll give you the full force of my attention and publicity skills to ensure that we both turn a tidy profit on your brain trust in addition to setting up a slate of appearances and book signings. If you’re willing to put in the work, so am I. 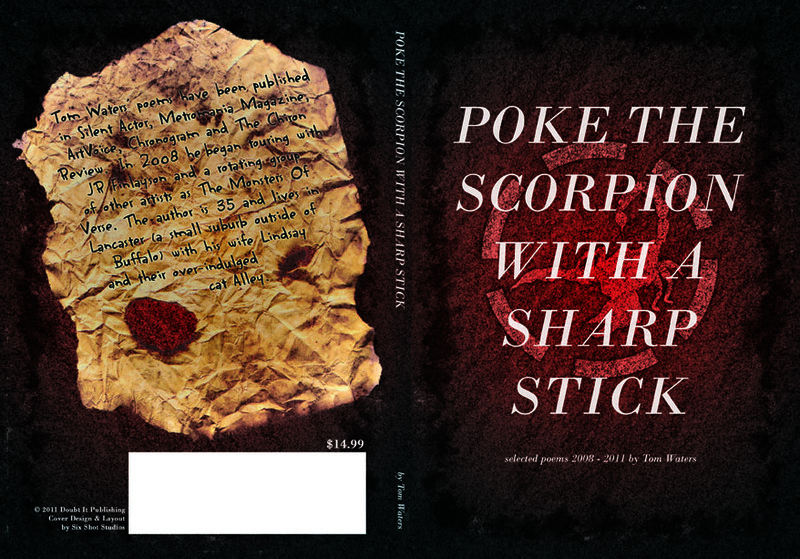 Thanks in large part to graphic designer extraordinaire Brian Platter (Six Shot Studios), Poke The Scorpion With A Sharp Stick is coming along at a brisk pace. The book should be available by August 1st at the rate we’re going, but I won’t count my chickens yet. The format size is being developed so that it bridges Breathing Room Volume I and II. The size of the book will be somewhere in between both, which says a lot about the content. The cover looks gorgeous and I couldn’t be happier with the bold design choices that Brian has made for the interior. For those of you daring enough to jump head first into a poetry book, you’re in for a pleasant surprise this fall. JR Finlayson, David Waters and a host of other local poets and I will be touring throughout Buffalo after the festival and concert season in autumn to promote the book as well as other books. This Sunday I’ll be returning to Think Twice Radio to interview broadcasting icon Brian Kahle for The Big Words I Know By Heart Radio Hour along with local artist and blogger John Kindelan. We’ll be talking about censorship, the line that’s blurred between advertising an investigative journalism and the current state of Buffalo broadcasting. The conversation will be bold and uncompromising, but I’m sure you’ve come to expect that from me. Your frequent (and often vocal) encouragement has molded me into the person I am today. These are exciting times. While my pace may be brisk and my candor unforgiving, it’s all because I’m building the framework for a larger plan. The first ten years of my professional career as a writer are over. I’m headlong into the next ten and the scope and landscape of a grander design is well underway. For those of you willing to participate and play along, I’m eternally grateful. As for the rest of you, you’re missing out on something very real and extremely fun. You are currently browsing the big words i know by heart blog archives for June, 2011.